As owners of a fantastic steam park, you`re to build gigantic, coal-powered rides to attract as many visitors as you can – but building attractions won`t be enough. You`ll also need to manage your employees, invest in advertising in order to attract and please the different kinds of guests visiting your park, and, above all, keep the dirt that your park produces under strict control! 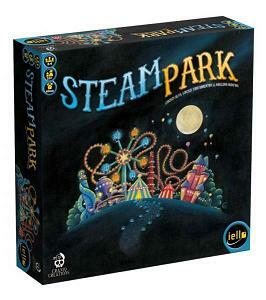 Steam Park is an easy-to-learn game with two difficulty levels: one for the less experienced gamers and a more strategic one for those who want a more exciting challenge. In this management game, you`ll have to build your own amusement park and make it the largest and most profitable in the region. By constructing the three-dimensional, wonderful rides designed by Marie Cardouat, you will see your park grow right before your eyes. Choose your strategy! Build Stands to attract more Visitors, or Toilets to keep the Dirt under control. Whatever decision you take, take it quickly: The less time you spend planning, the more time you`ll have to maintain your park. Thanks to a clever, original action-choosing mechanism, winning in Steam Park is as much a matter of being the best as of being the fastest!